is contained with this product and must be displayed on the inside of the door to comply with fire regulations. 294 Single Panic Bolt The Exidor 294 is an elegant and highly functional panic bolt for single and double door applications. Incorporated as standard is an automatic top trip and easy clean floor socket. The main body is fitted with an anti-thrust device which prevents leverage of both the top and bottom shoot bolts from their sockets. Suitable for use where inhabitants have no prior knowledge of door exit routine in an emergency. 322 EC Lever Operated OAD c/w Euro Cylinder Lever operated OAD (outside access device, in this case a locking lever handle) suitable for use with the Exidor 200/300 series. Can be used in regular access from the outside. Suitable for use where consideration of access for fire fighting is required. We got the bill-board sign up today, John from Kerry happened to drop by the store to check on something and I asked him for a hand to get my bill-board sign up. 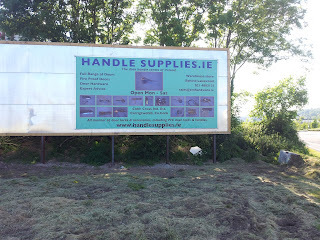 Just to prove that there are still people out there who will lend a hand at the drop of a hat, for three hours we used the fork lift, extension ladder and an assortment of rubber tape and metal framing to get the canvass bill-board up. It was a great advantage that John from Kerry normally works as a tree surgeon with my brother. Now at least we can tell customers who want to find our store, 'if you are at the bill-board you are only 200 meters from our warehouse store'.